To describe what it is like to own an old inn in Vermont is like trying to describe what it is like to be happily married. From the outside, all appears quaint, cute, and happy. But there is a lot of work that goes on behind the scenes to make things work. A lot of innovation and creativity. A lot of compromise. Compromise? With a building? Oh, yeah. 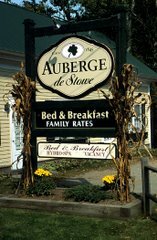 The building that is the Auberge is 170 years old. It has outlasted four or five generations of cagey Vermonters, and it will probably outlast me. That's not to say that I don't wield certain advantages, mostly in the form of power tools. But the building has an inertia which transcends anything I can throw at it. The building has patience. The door to my basement is not regulation. It is only 65 inches high. I am 72 inches high. So there is some yellow tape warning me to duck before I pass through the doorway. Most of the time I remember to duck, but because I am Irish I sometimes lose my temper, and when that happens, the doorway brings me back to earth. Now, I'm not saying that there is a conscious effort on the part of the Auberge to moderate me...after all, it was probably the Auberge--in the form of a renegade plug or a leaking faucet--which set me off in the first place. But the fact remains that this old place has a habit of laying down the law when need be. This is because there is always something that needs to be done around here. That's where the comparison to marriage comes into play. It's not the big things that I do around here that make it work. It's the little things. Regular seasonal maintenance is more important than can be adequately described. Sure, a new heating system is nice, but it doesn't rent us any rooms. The little things are what make people--and old inns like the Auberge--happy. So when you come up for a visit and you see an eclectic old place like ours, remember this: it's a work in progress. Oh, and be careful where you step, there might be a cagey old Vermonter crawling around the shadows, rewiring or caulking or trying to find out where the mouse gets in.